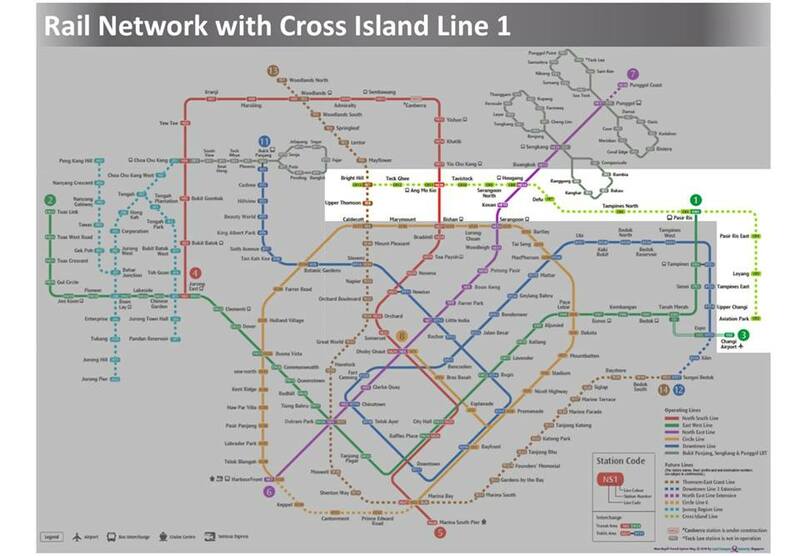 The Cross Island Line (CRL) is Singapore’s 8th MRT line, stretching from Changi to Jurong. 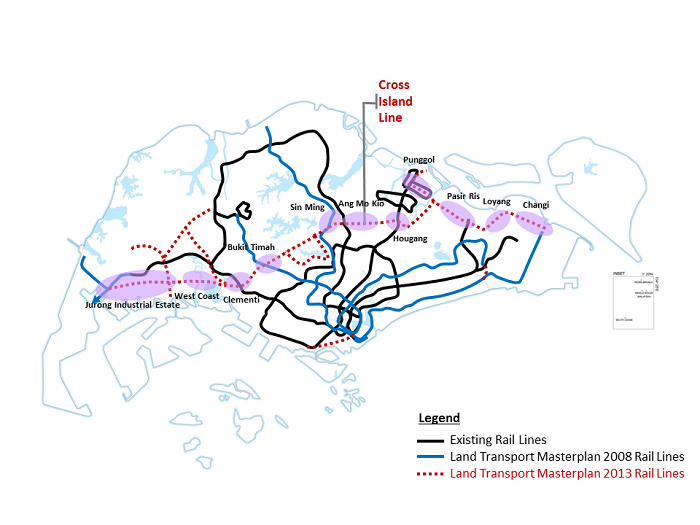 Phase 1 of the Cross Island Line has been announced. 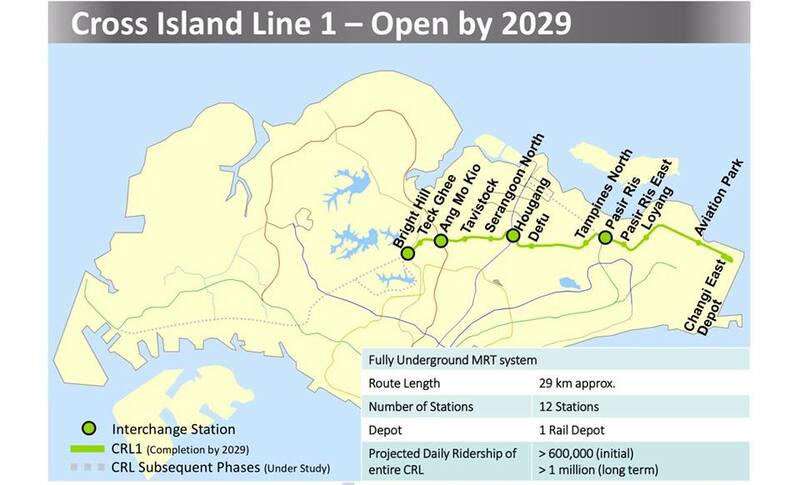 It will cover 29km and have 12 stations, starting from Aviation Park in Changi to Bright Hill in Sin Ming. 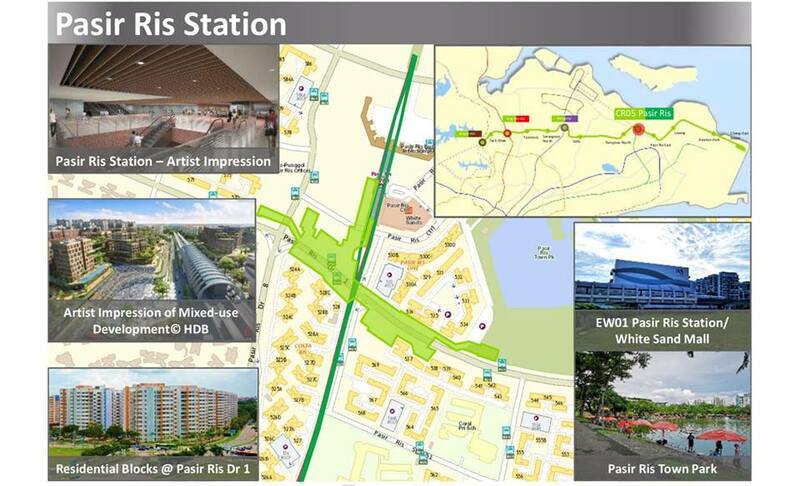 From there the line is planned to extend to Bukit Timah, Clementi, West Coast and finally Jurong Industrial Estate. Read on to learn more about each station in Phase 1 and the properties near them. Serving the area around Aviation Park Road, near Changi Air Base. The station number is “CR2”, as LTA is considering linking the CRL to Changi Airport Terminal 5 so “CR1” is reserved for the potential airport station. Located in between Loyang Industrial Park and Loyang Valley condo. This will greatly benefit those working in the Loyang industrial area. Located along Pasir Ris Drive 1. Loyang Point, Pasir Ris Polyclinic, White Sands Primary, Loyang Primary/Secondary, Greenview Secondary and the surrounding HDB estates are within walking distance. Interchange with the East West Line (EWL). 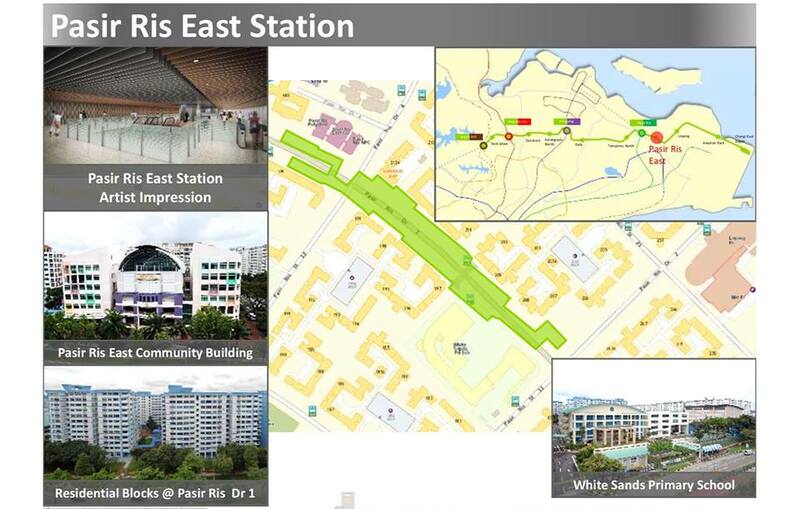 The existing station next to White Sands mall will be expanded along Pasir Ris Drive 1. A mixed used development may be built next to the station. 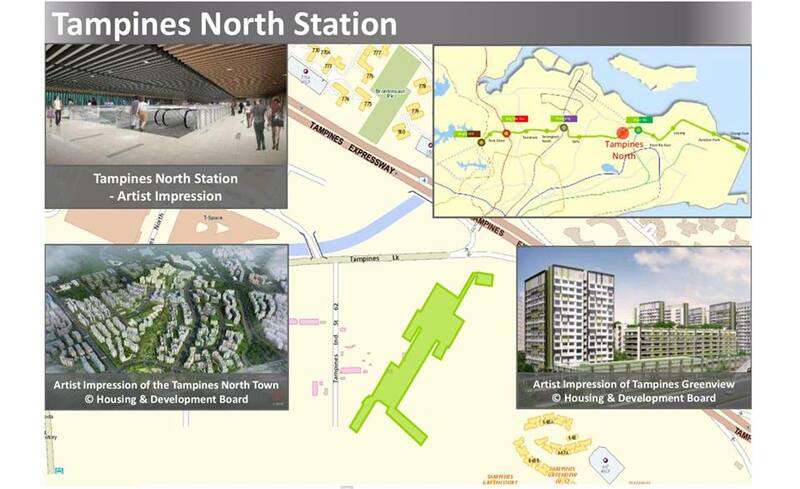 Located on vacant land between Tampines Avenue 11 and Tampines Industrial Street 62, this station will support the new HDB estates at Tampines North and Tampines North Industrial Park. Ikea, Giant and Courts Megastore are also in the vicinity. Serving the Defu industrial area, the exact location is yet to be confirmed. Interchange with the North East Line (NEL). 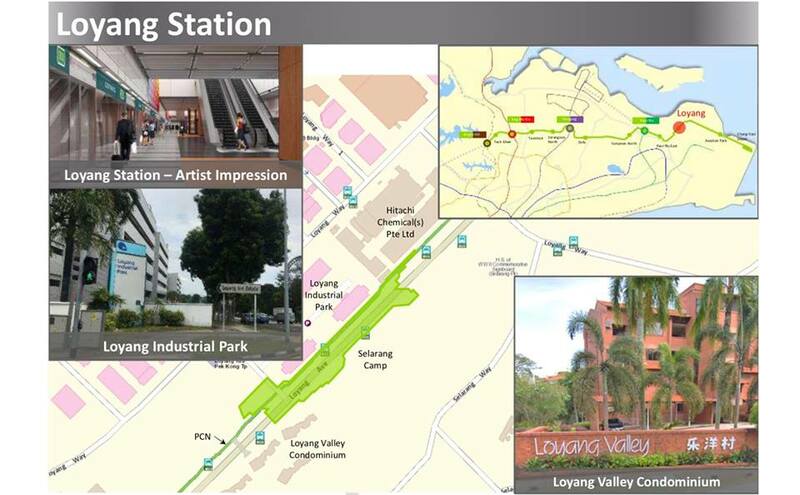 The existing Hougang station will be expanded onto adjacent vacant land and possibly integrated with the Hougang Central Bus Interchange next to it. There is potential here for a mixed development above the new station. Serving the Serangoon North HDB estate and schools such as Rosyth School and Bowen Secondary. Gain City and Daikin Airconditioning buildings at Ang Mo Kio Industrial Park 2 will be acquired to make way for this station. Tavistock Avenue Park may also be used for the station, and subsequently developed into a residential or mixed development. Interchange with the North South Line (NSL). Ang Mo Kio Hub – next to the existing station – will be acquired and Ang Mo Kio Bus Interchange will likely be integrated into the new station. A new mall or mixed development is likely to be built above the new station. Serving Teck Ghee HDB estate, the exact location is yet to be confirmed. Interchange with the Thomson East Coast Line (TEL). Kong Meng San Monastery will be acquired to make way for the station. It is likely that the vacant land opposite and the monastery site (quite a large one) will be developed into residential and/or mixed developments.